Okay it is an amazing blog. The photos are drool inducing. I wish I lived next door to the writer. But I do not so I just make her recipes. 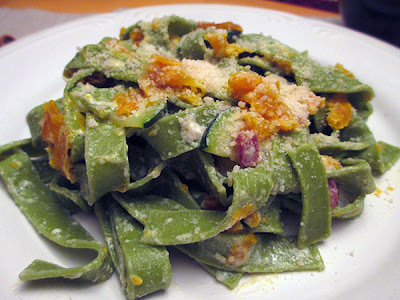 Tonight I made Butternut Squash Ribbons with Spinach Tagliatelle. But I made a couple of changes in the recipe. Chris is not a mushroom fan so I substituted zucchini. And I added pancetta. Yeah that was a nice addition. I picked up pancetta at the Meat House, more on that later in the week. I had it sliced into 1/2 inch slabs. I diced one of the slabs and fried it up. Nice and crisp! Then I cleaned the pan and sauteed the zucchini in a little olive oil, seasoning it with salt and pepper. I made the cream sauce following the recipe and added the squash and other ingredients at the end. Gosh this was so good. Not heavy at all. And did I mention how good the pancetta cubes were? Here is my version of the recipe but if you want the original version, Click Here. Cut the top off of a long neck medium sized butternut squash, peel skin off then make long ribbons using a vegetable peeler. Turn as you peel. Toss into a bowl and drizzle olive oil and salt and pepper all over then place on a rimmed baking sheet and roast at 375 to 400 until edges start to curl, keep watching as to not burn. Set aside. In a saute pan drizzle olive oil. Pour in the cream, stock and cheese, cook until slightly thickens. Add the zucchini and gently toss everything together and place on a platter adding more grated cheese, a nice drizzle of olive oil and fresh parsley for garnish. While dinner was cooking we had some munchies. 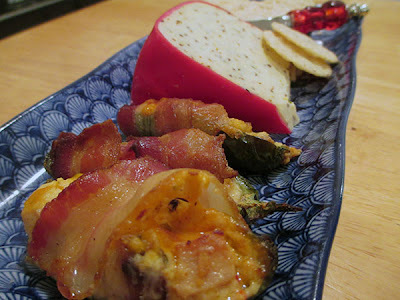 I picked up some bacon wrapped jalepeno poppers, what's not to like about that! And some cheese. English Cheddar Cheese with Mustard and Ale. Yum! 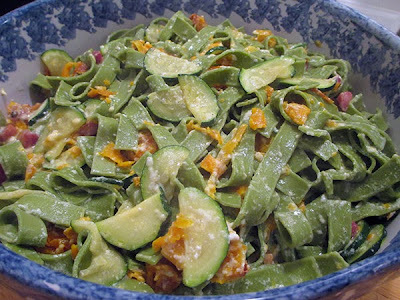 Dear Lucia, This meal looks wonderful and so does Marie's blog. She certainly is a wonderful cook. I love what you had for snacks while the meal was cooking too.